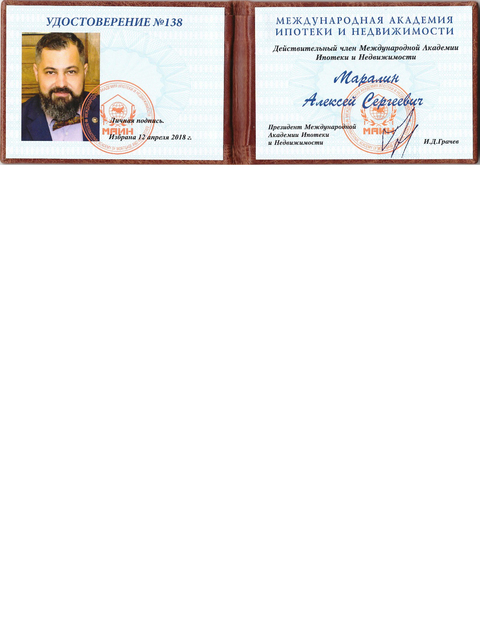 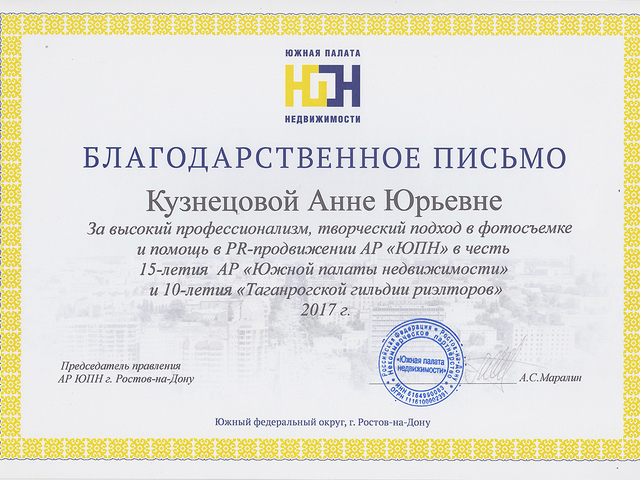 Laureate of the national award "expert of the real estate market" in the nomination " the Best agent in the elite housing market"
The diploma of the winner of the contest "Best real estate Agency and realtor of Southern Russia 2017" in the nomination "person of the year in the real estate market"
Certificates that Panina Anastasia Alexandrovna has knowledge conforming to requirements imposed by the Standard HUNDRED RGR "Realtor activities. 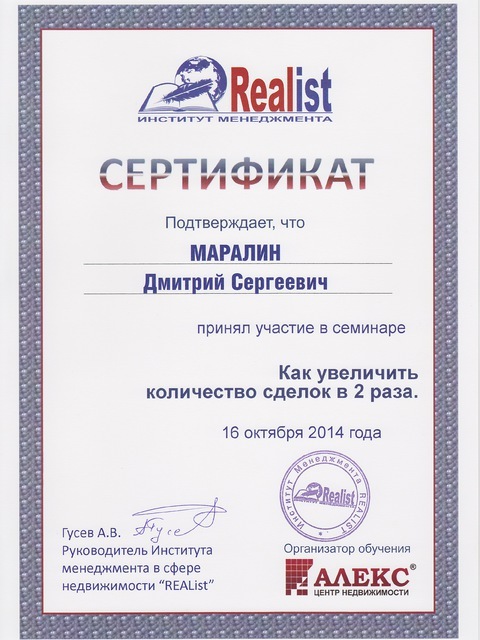 Services broker in the real estate market. 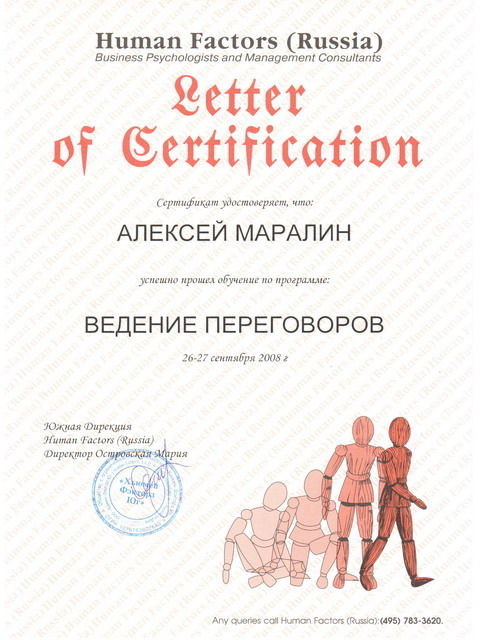 General requirements" and certifications. 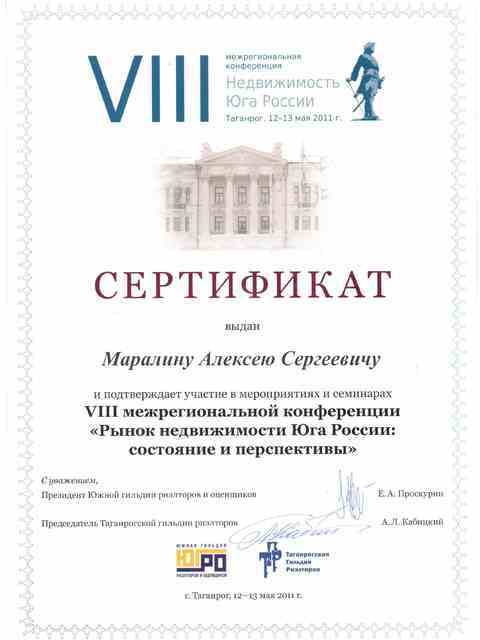 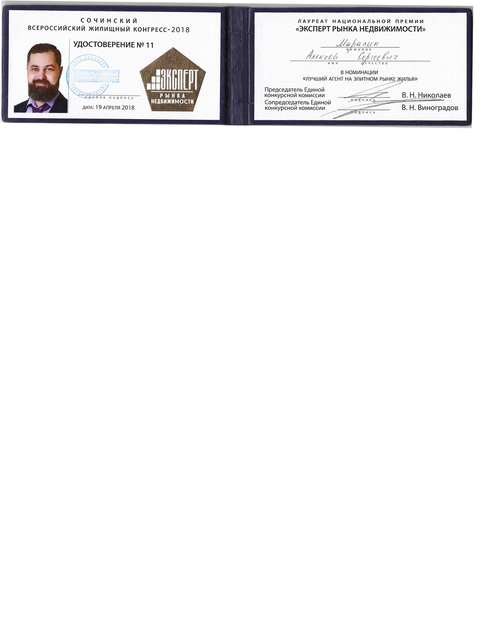 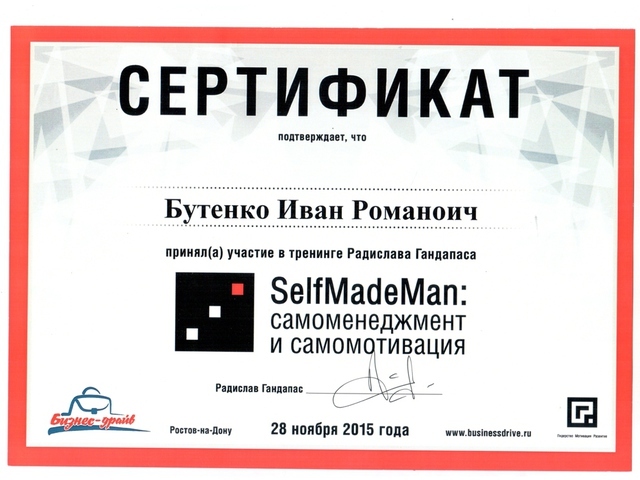 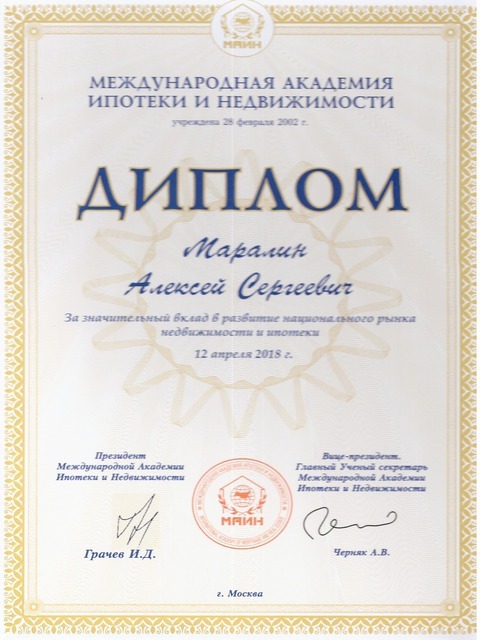 The certificate confirms visit of a master class of Vladimir Solovyov - Tough negotiations. 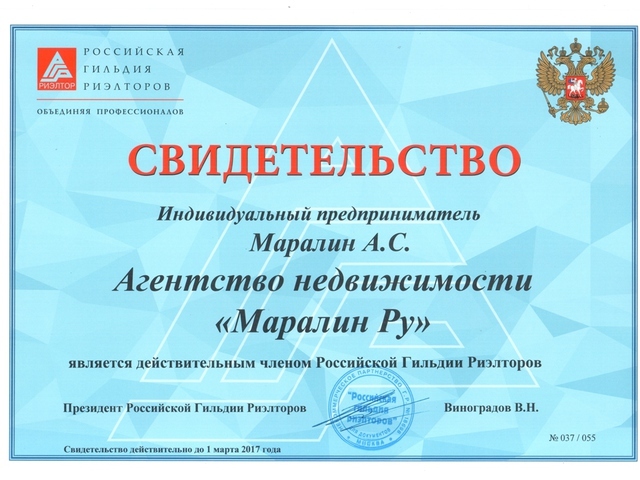 Manipulations: Attack and Be protected. 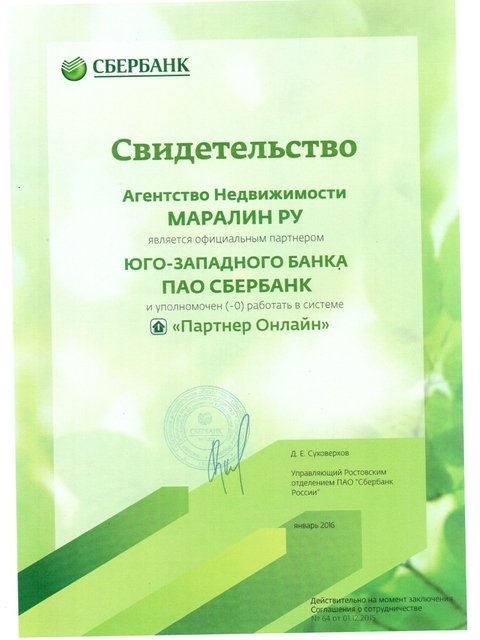 It is given out by the insurer "Alfastrakhovaniye". 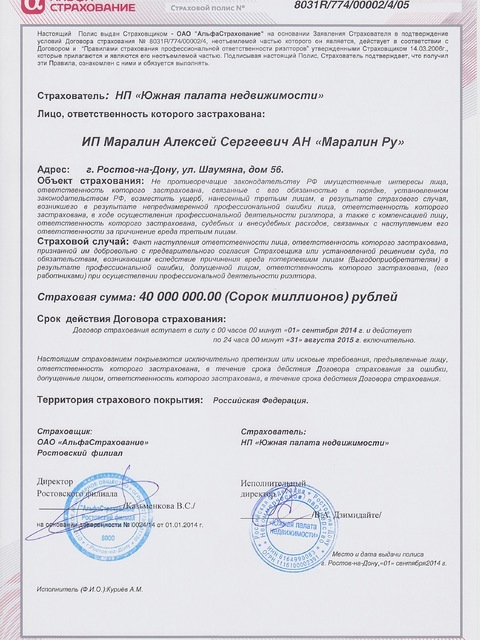 Responsibility of agency of elite real estate Maralin Ru it is insured for 40 000 000 rubles. 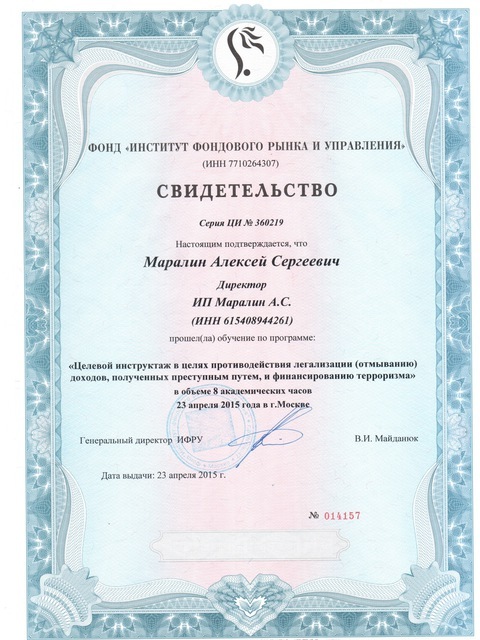 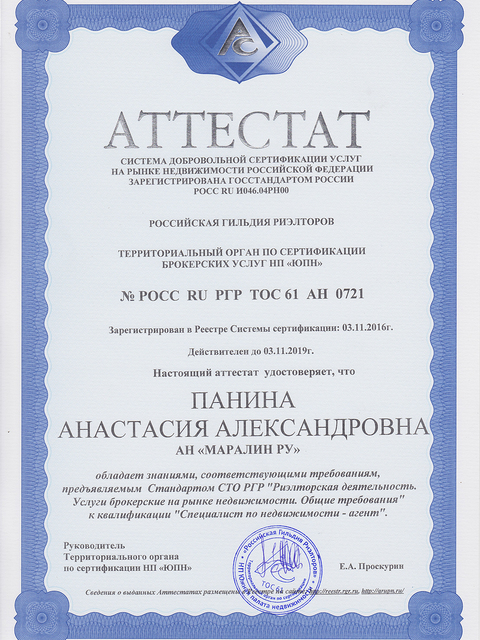 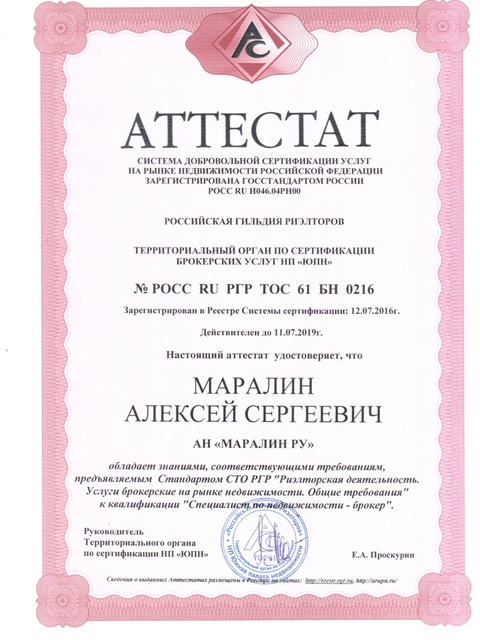 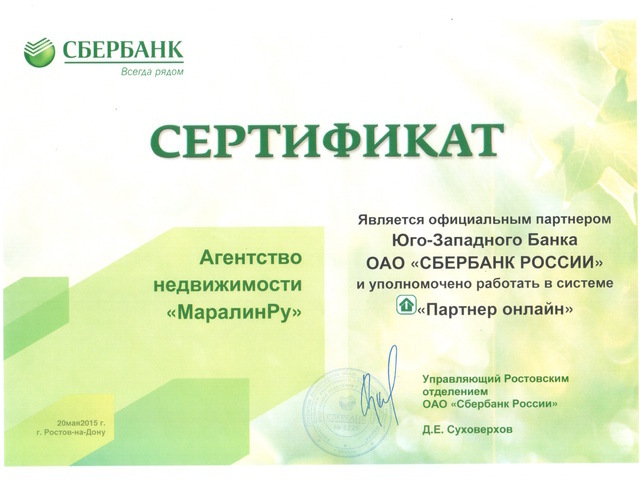 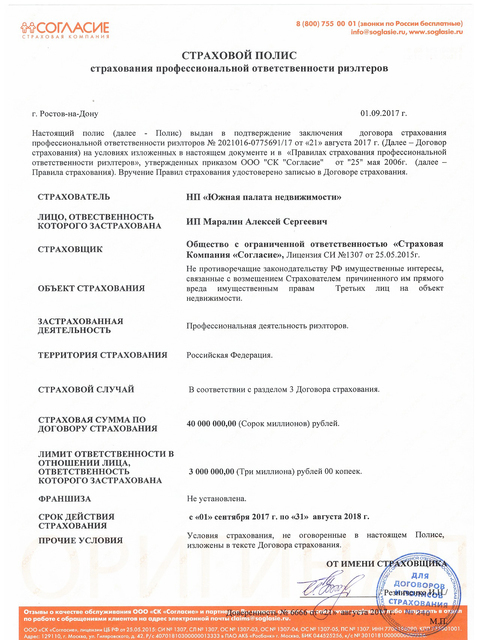 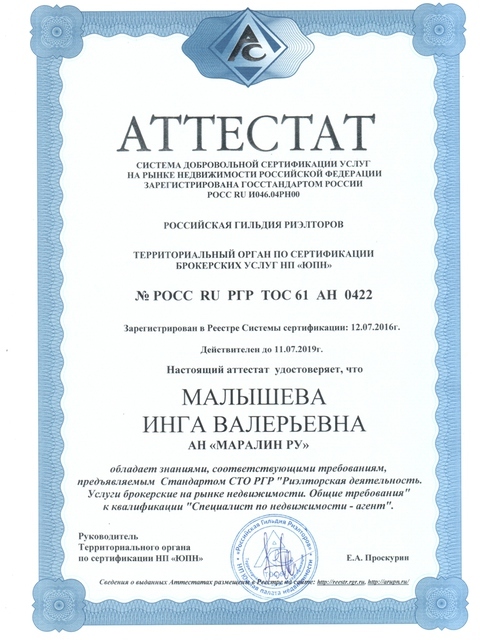 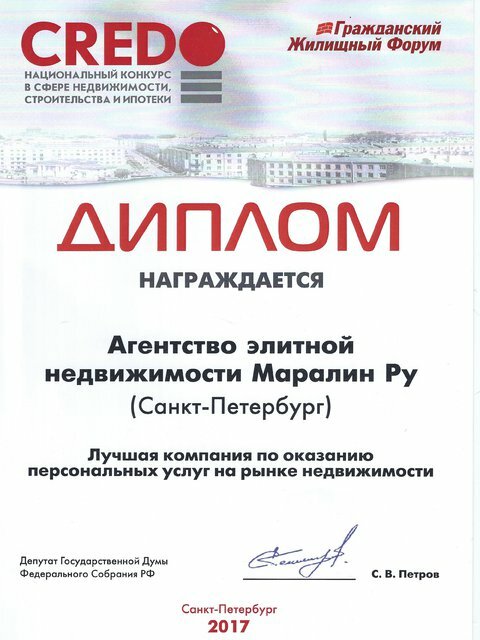 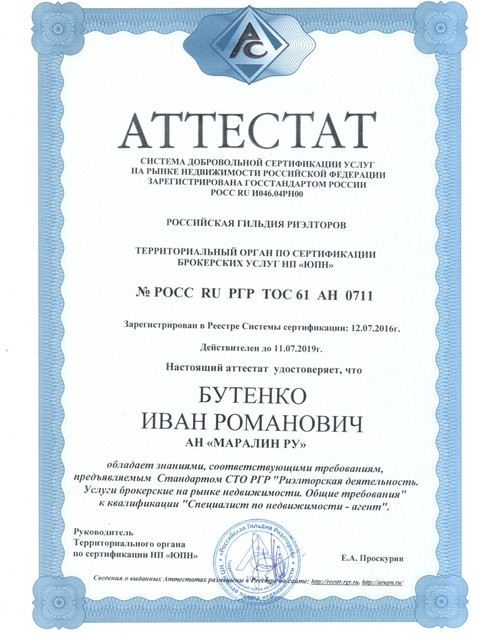 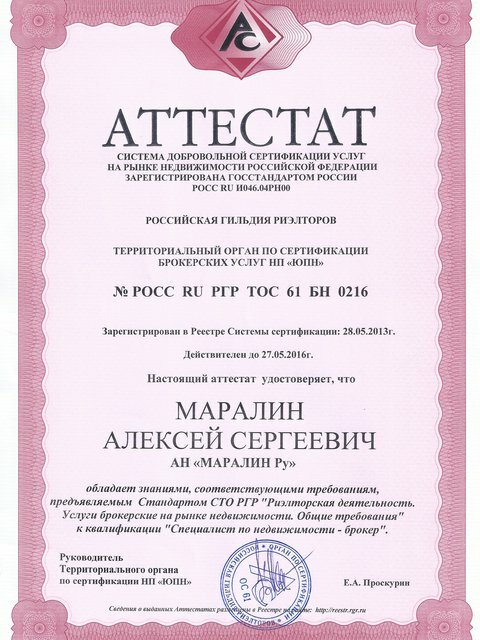 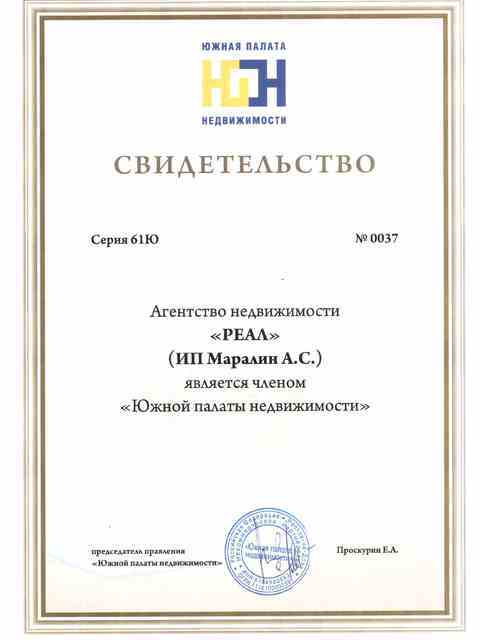 Were trained "Target instructing for counteraction of legalization (washing) of income gained in the criminal way and financings of terrorism"
The certificate confirms that Maralin D. S. participated in a seminar "How to increase number of transactions twice"
The certificate confirms that Butenko I.R. 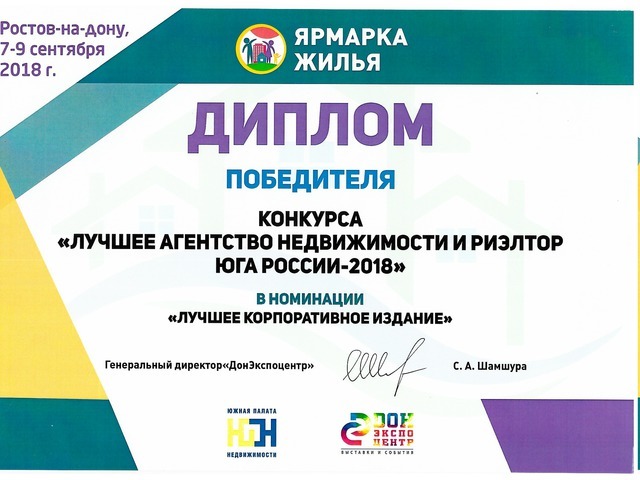 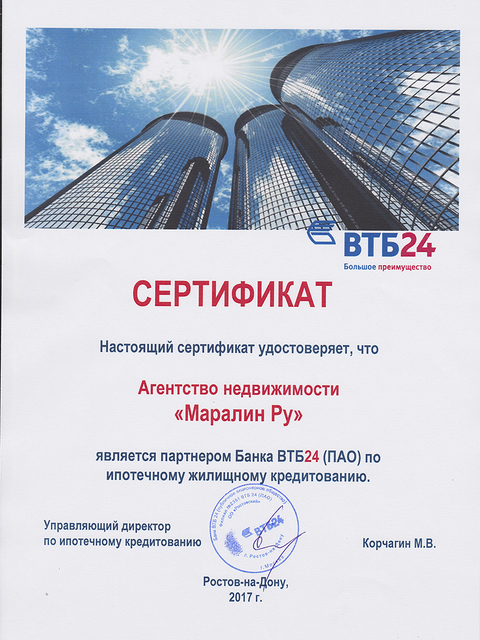 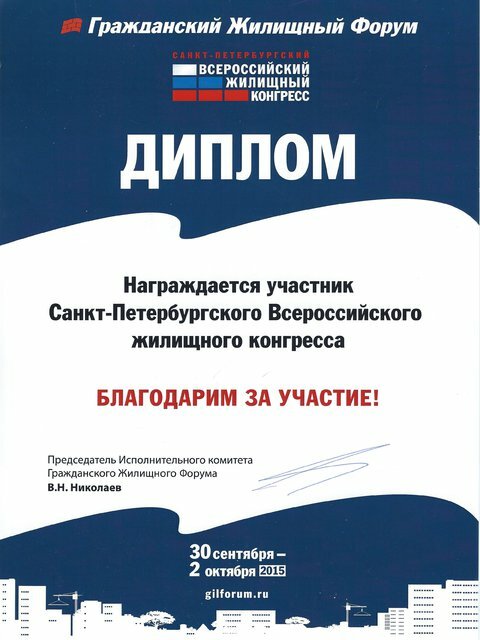 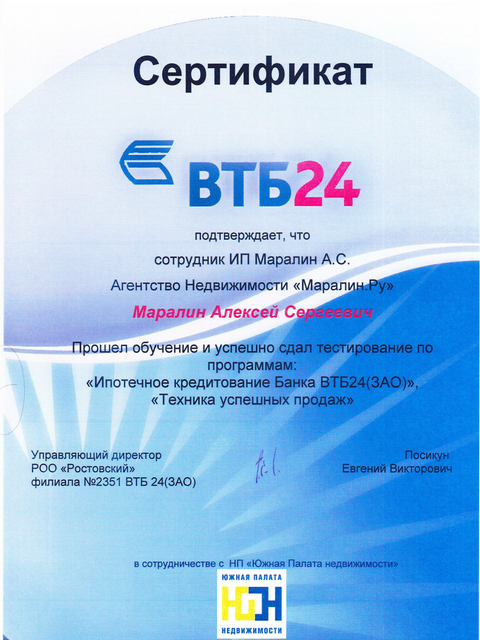 I participated in a seminar "How to increase number of transactions twice"
The present certificate confirms that Maralin Alexey Sergeyevich was trained and successfully handed over testing according to programs: "Mortgage lending of Bank VTB 24, "Equipment of successful sales"
Association of realtors of St. Petersburg and Leningrad region. 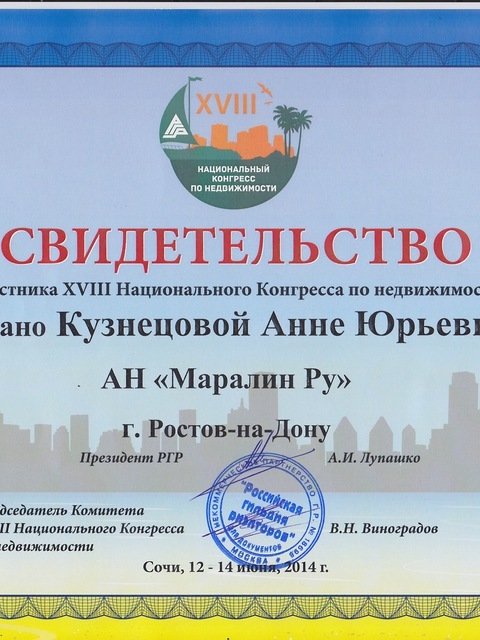 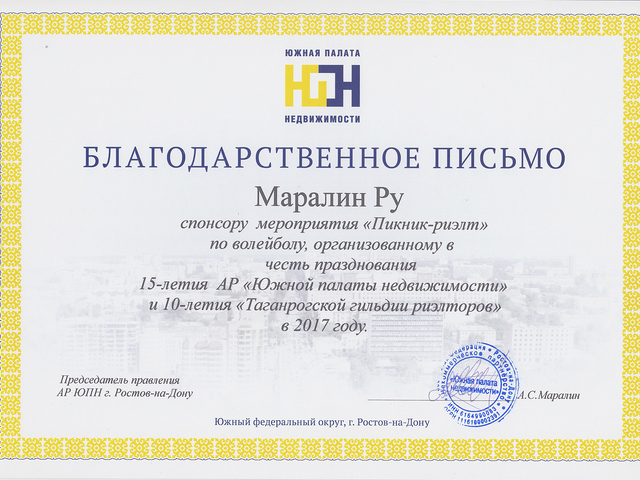 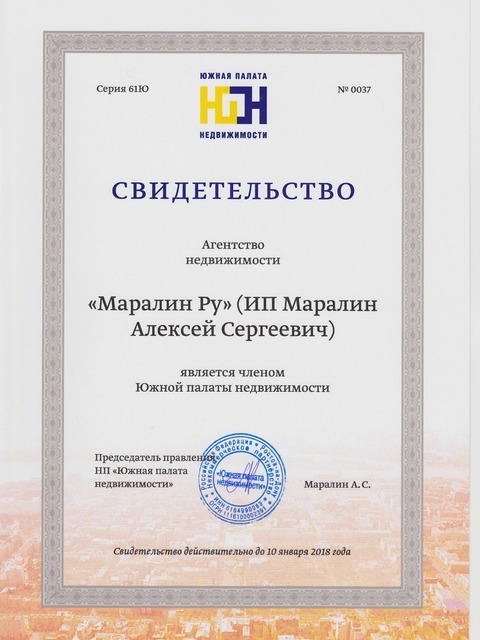 Real estate agency Maralin Ru the participant of the VII international competition of sites WEB Realtor-2013 in the nomination "The Best Regional Site of Real Estate Agency"
It is given out by the insurer "Alfastrakhovaniye". 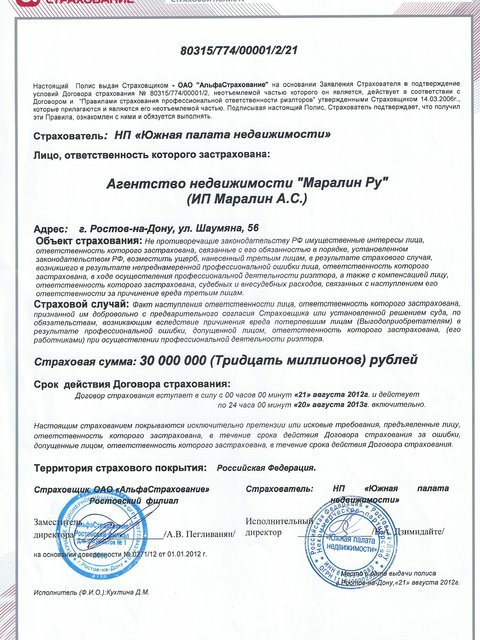 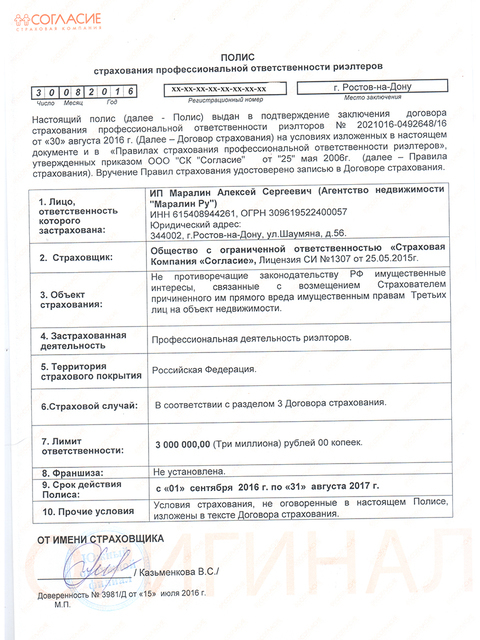 Responsibility of agency of elite real estate Maralin Ru it is insured for 30 000 000 rubles. 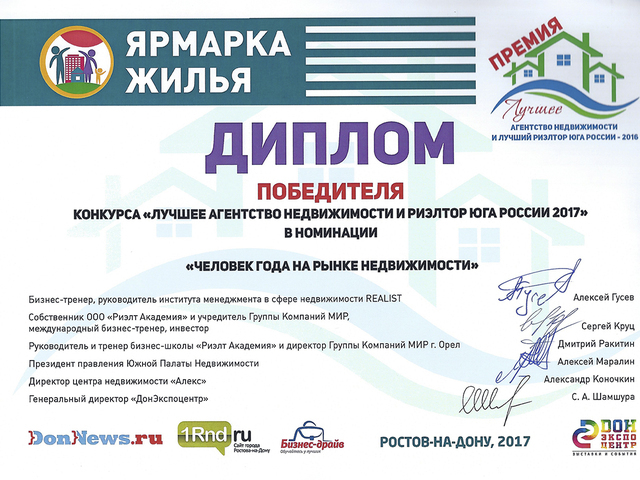 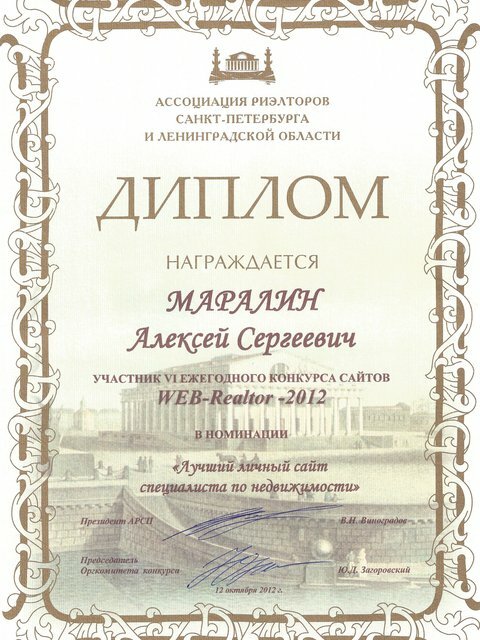 Association of realtors of St. Petersburg and Leningrad region. 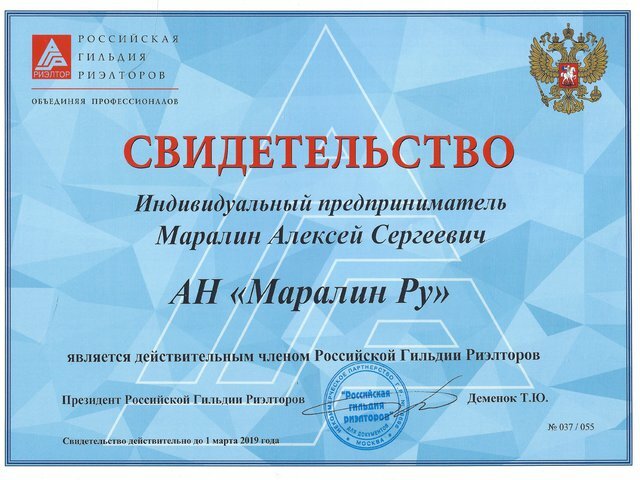 Maralin Alexey Sergeyevich the participant of the VI annual competition of sites WEB Realtor-2012 in the nomination "The Best Personal Site of the Expert in Real Estate"
It is given out to Maralin Alexey Sergeyevich and confirms participation in actions and seminars of the VIII interregional conference "The market of real estate of the South of Russia: state and перпективы" on May 12-13, 2011. 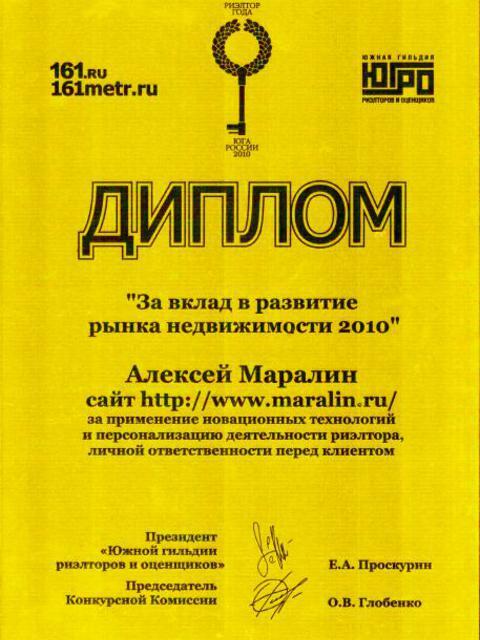 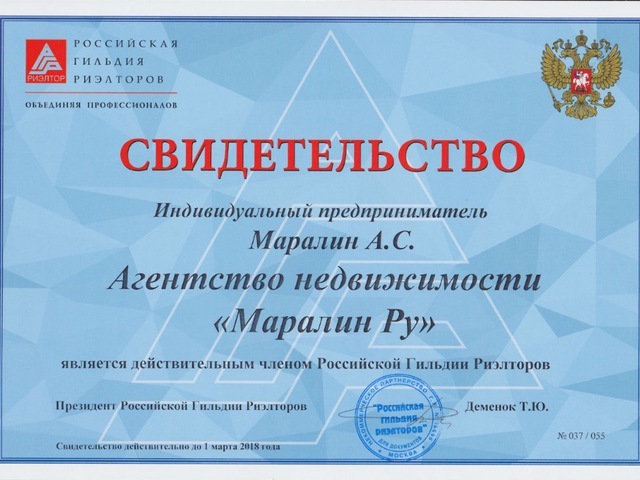 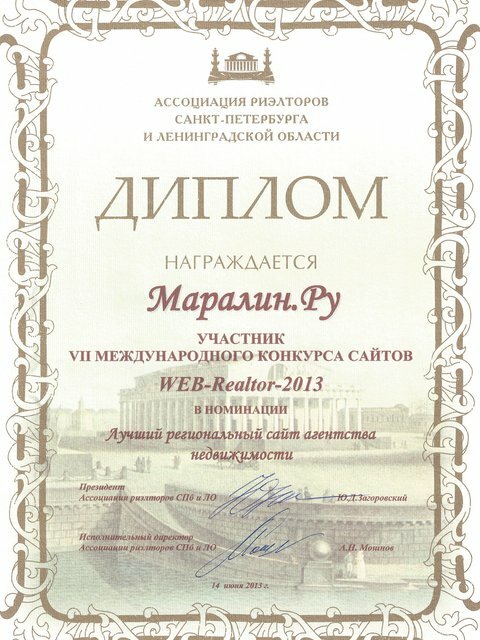 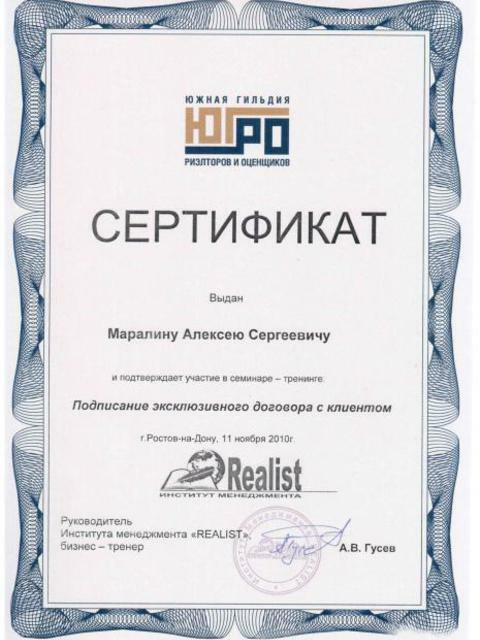 "For a contribution to development of the market of real estate 2010" the site www.maralin.ru for application of innovative technologies and personalisation of activity of the realtor, a personal responsibility before the client is awarded. 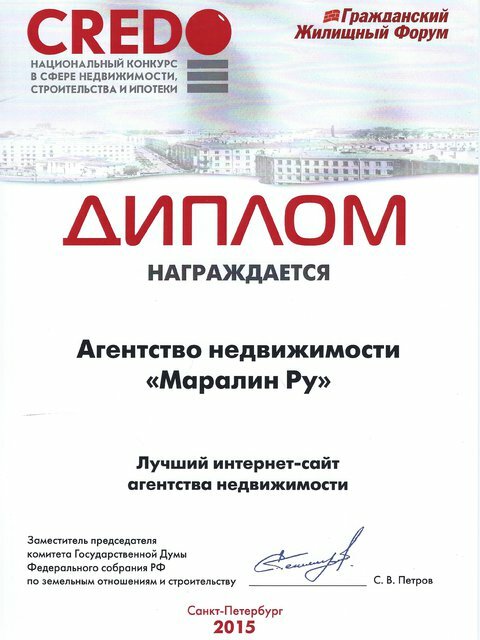 For special merits and a big personal contribution to development of the Don-MT company and effective management of Department of new buildings. 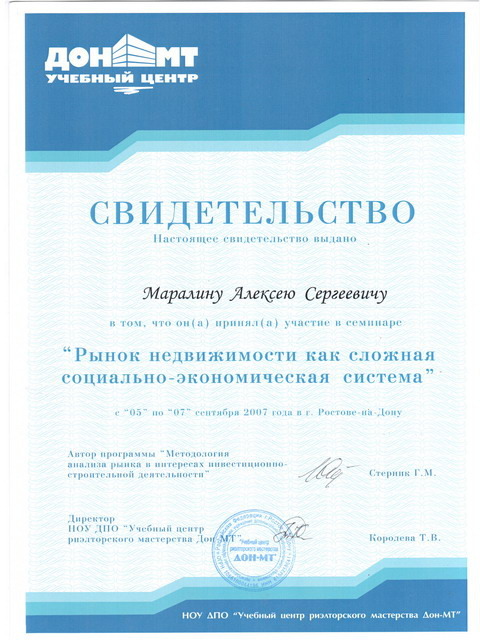 I was trained according to Business Psychologists and Management Consultants HUMAN FAKTORS Negotiating program on September 26-27, 2008. 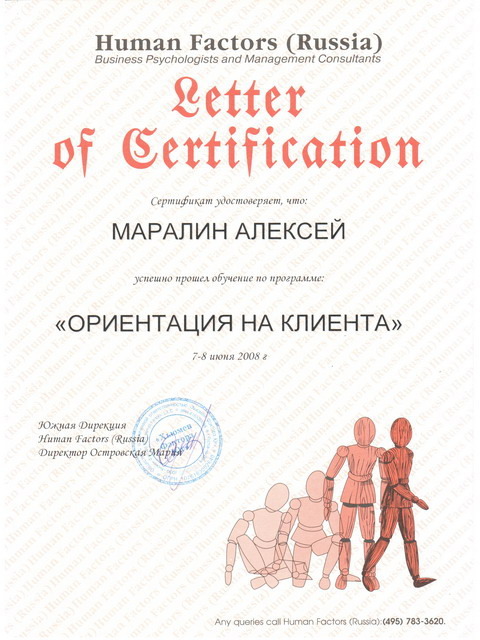 I was trained according to Business Psychologists and Management Consultants HUMAN FAKTORS Orientation to the Client program on June 7-8, 2008. 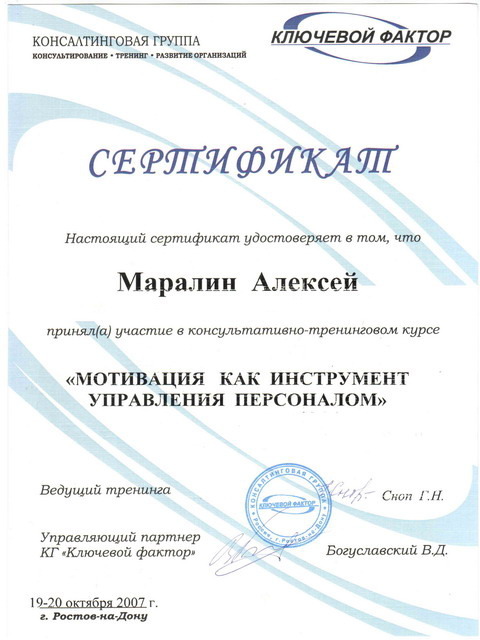 I was trained according to Business Psychologists and Management Consultants HUMAN FAKTORS Mentoring in Business program on March 14-15, 2008. 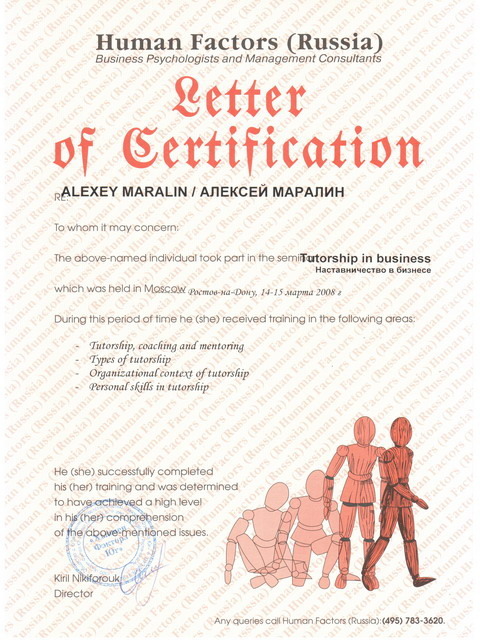 Participation in a master class "Work with the client: Commission argument. 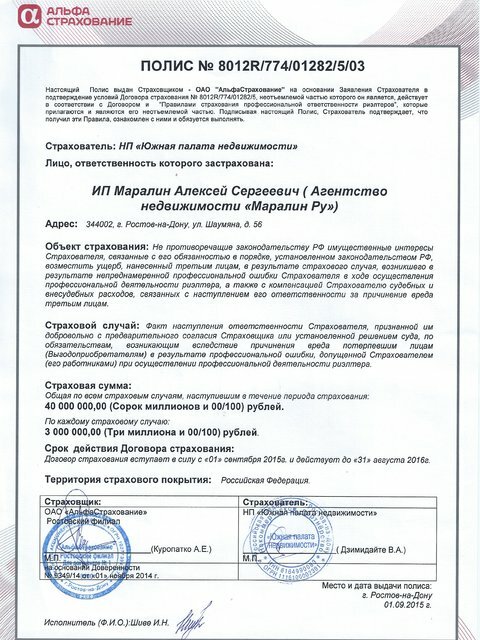 Conclusion of the exclusive contract" on May 31, 2008. 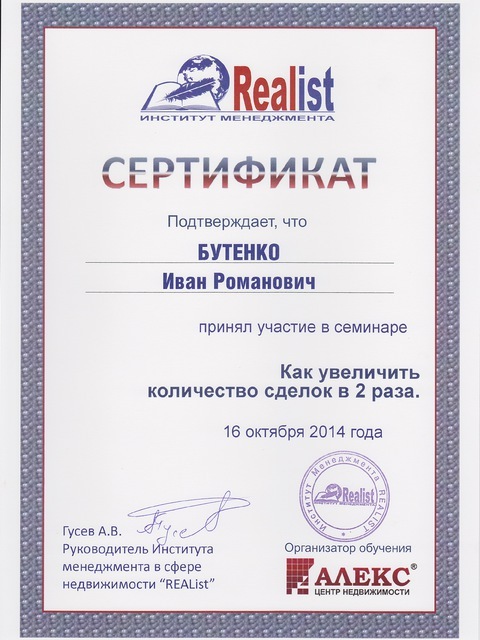 Certificate qualification real estate broker. 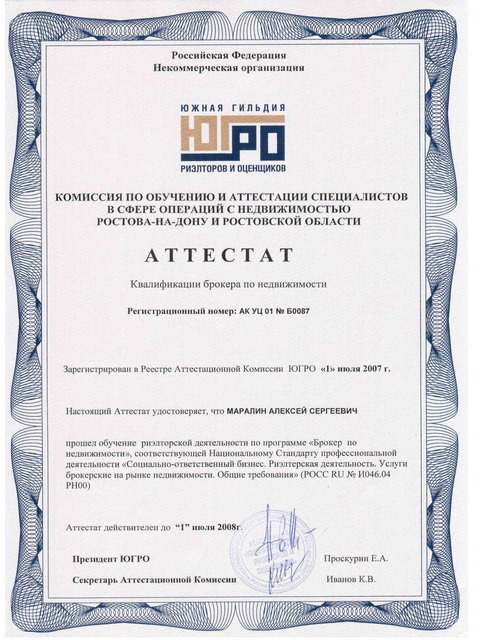 It is registered in the Register of the Certifying commission of YUGRO on July 1, 2007. 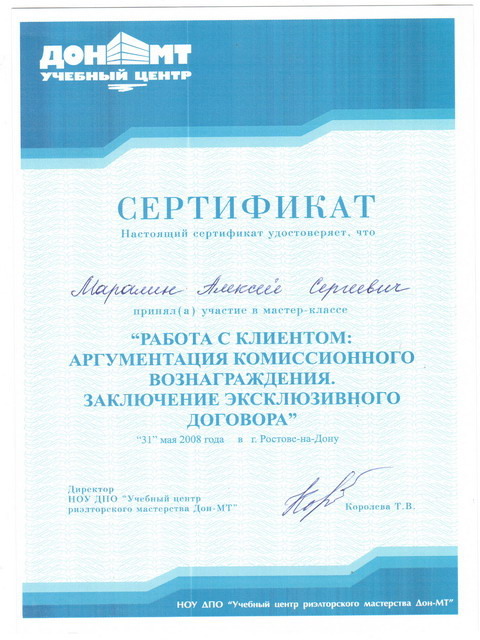 Participation in a seminar "Analytical support of investment and construction activity" from November 29 to December 01, 2007. Participation in the advisory and training course "Motivation as Instrument of Human Resource Management" on October 19-20, 2007. 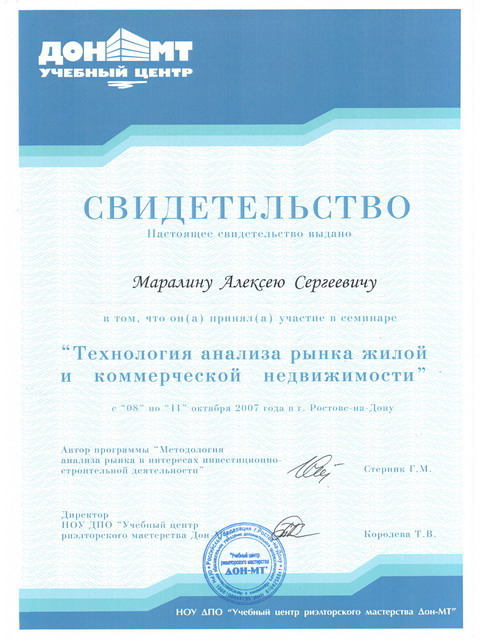 Participation in an advisory and training course "Operational management: Delegation statement execution tasks control" on September 29-30, 2007. 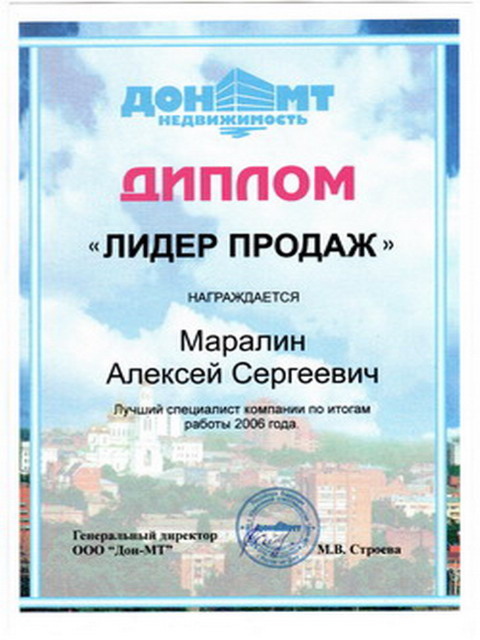 Participation in a seminar "Real estate market as difficult social and economic system" from September 05 to September 07, 2007. 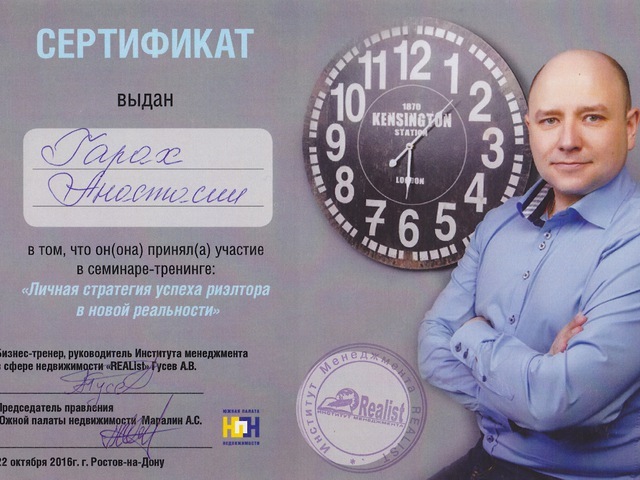 Leader of sales. 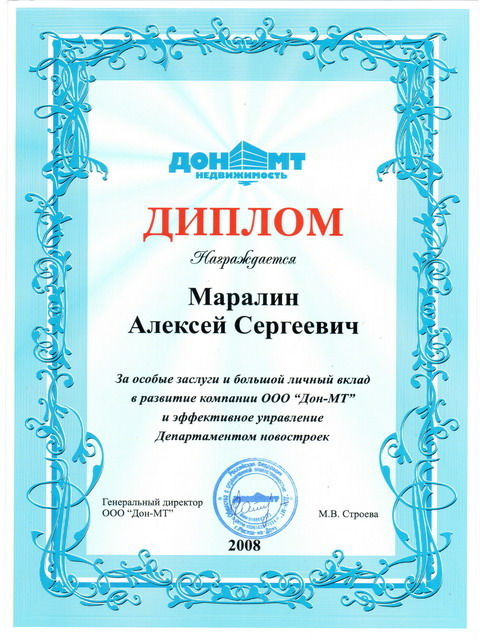 The best specialist of the Don-MT company following the results of work of 2006. 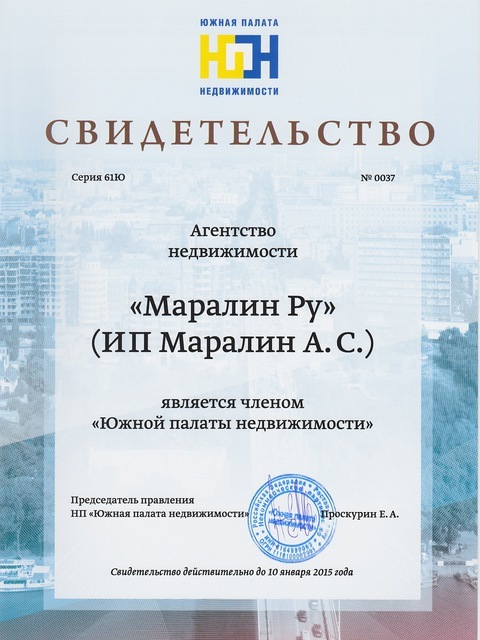 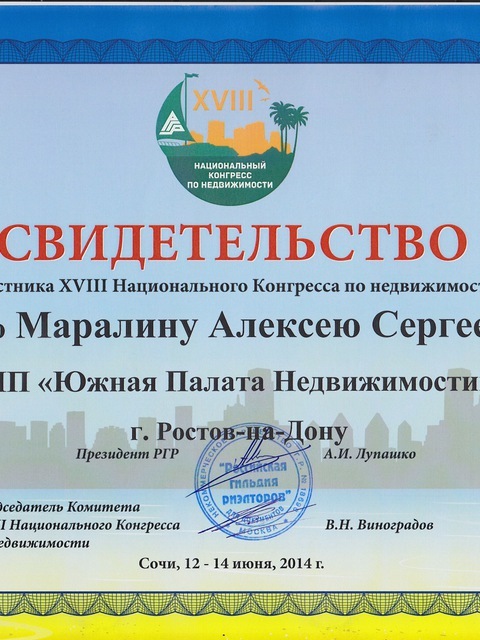 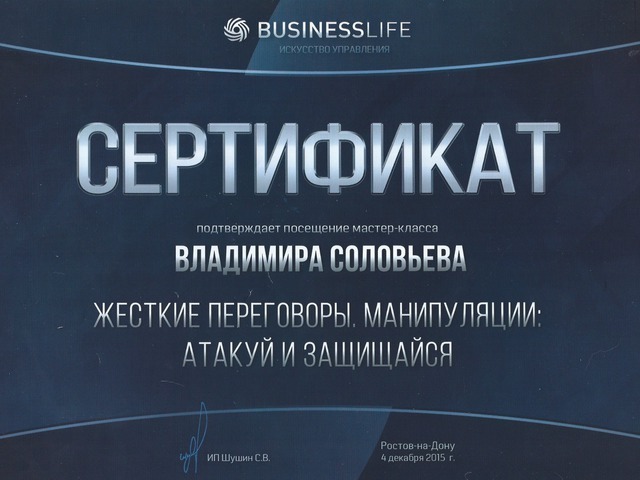 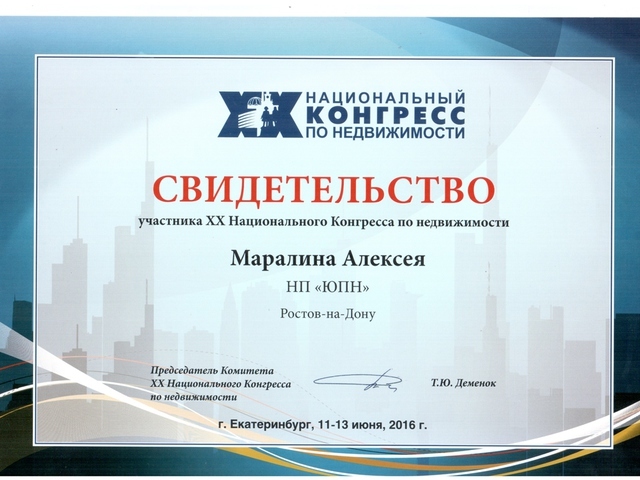 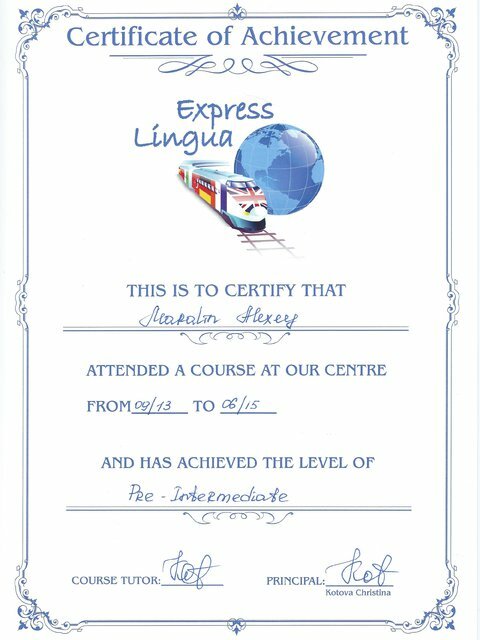 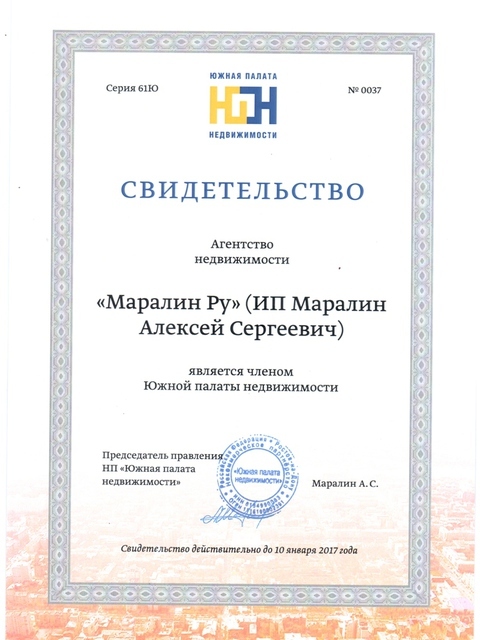 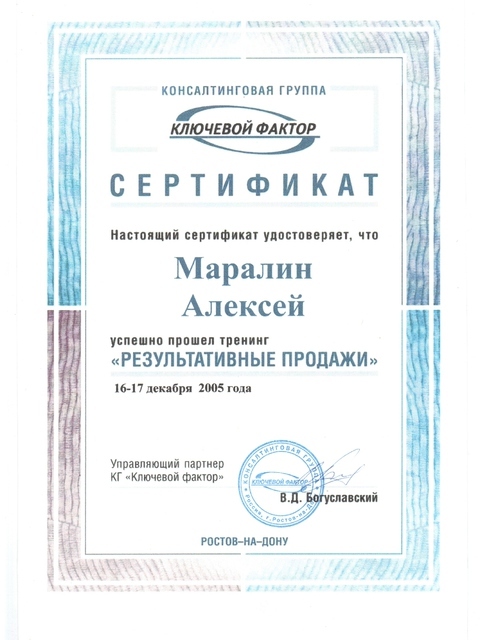 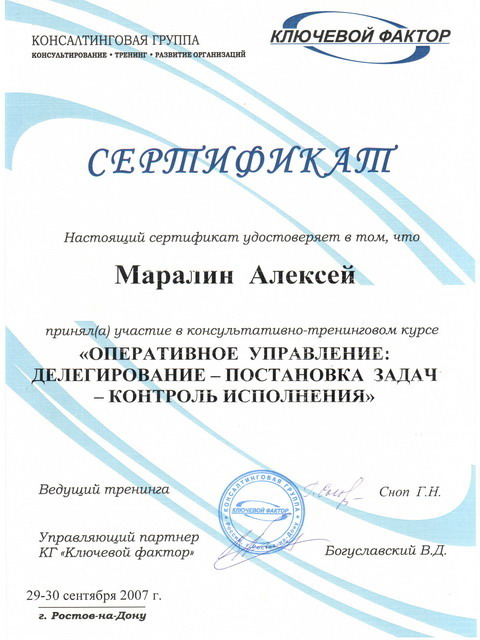 The present certificate certifies that Maralin Alexey successfully passed training "Productive sales" on December 16-17, 2005 in Key Factor consulting group.